This week we had the pleasure of talking to one of the most internationally renowned dermatologists, Prof. Dr. Berthold Rzany. 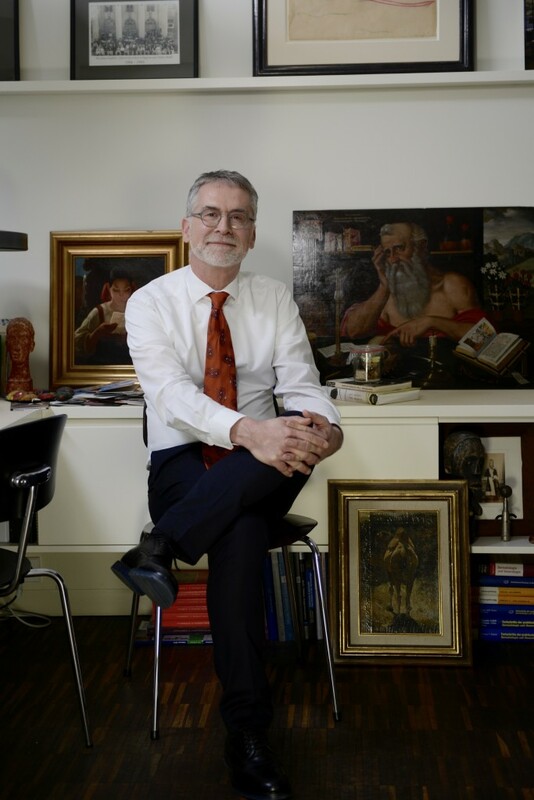 A leading figure in the field of dermatology and aesthetic medicine (such as botulinum toxin, injectable fillers), and the author of several major aesthetic medicine publications, Prof. Dr. Rzany has a special flair in figurative art, collecting broken sculptures of saints from 20th mid century and artworks depicting lean and chiseled athletic male body. 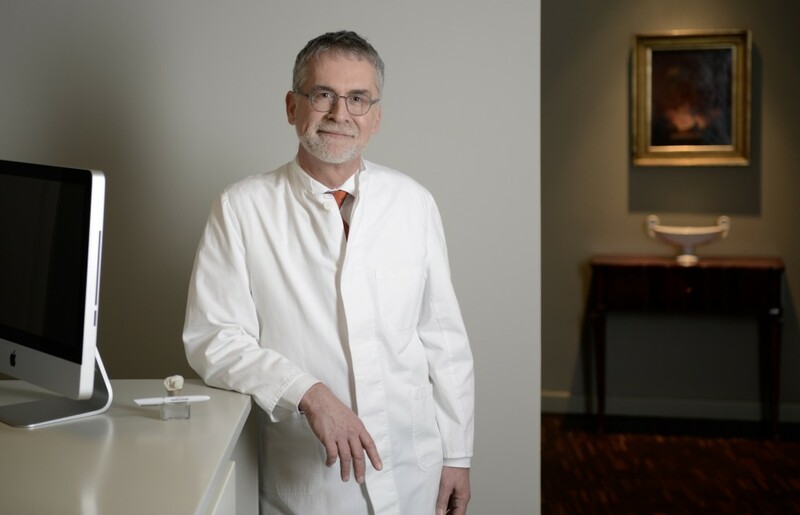 He opened his own clinic RZANY & HUND with his partner Dr. Martina Hund, and this is interestingly where he displays his incredible art collection, thoughtfully curated with the help of his architect friend, Hani el Hurt. 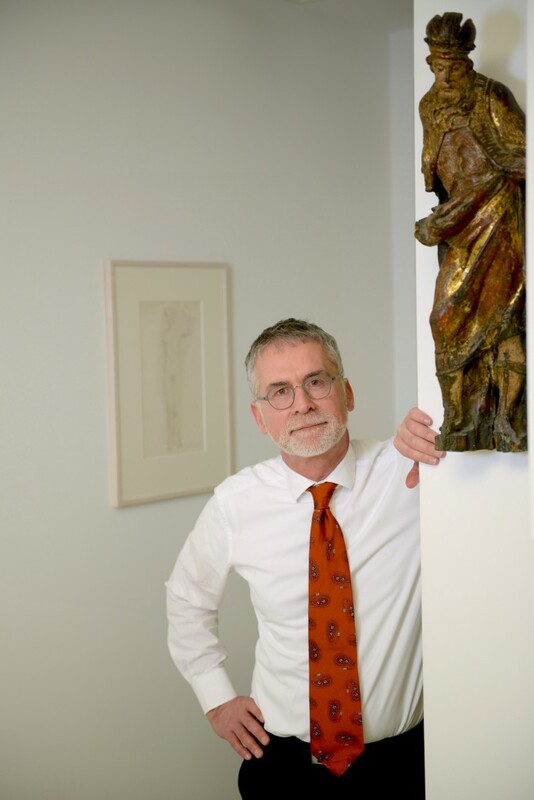 Prof. Dr. Rzany with a wooden sculpture of an unknown king, probably Spanish 17th century. In the back a drawing of young man from Gerhard Marcks. Courtesy of Prof. Dr. Rzany. Photo by Pascale Jean-Louis. Could you tell us what motivate you to start collecting? How was your first encounter with art like? I was always a collector. I remembered when I was a kid that I always carried something home, sticks, stones etc. I even have to admit that I killed butterflies and arranged them in marmalade jars like a museum’s exhibit (I still got one). I guess I started to buy art in the 80s, mostly photography and Japanese wood prints from the 19th century. In 2009, however, I got seriously attached when I bought from Grisebach (a Berlin auction house) a painting of a camel by Wilhelm Kuhnert shown from the backside (so far I have resisted in buying more animals shown from the backside – but you never know). On the ground next to Prof. Dr. Rzany: a painting of the backside of a camel by Wilhelm Kuhnert (early 20th century) which he bought from Grisebach. Courtesy of Prof. Dr. Berthold Rzany. Photo by Pascale Jean-Louis. What is your focus in your collection? What type of art do you feel most attracted to?Mostly figurative art – although I do have some abstract pieces which I love. My focus is mostly broken saints e.g. sculptures of saints where some pieces (mostly arms) are missing. One of my favorite is St. John with his eyes closed (obviously a part from a calvary) which is now in my surgery room. And then I am fascinated by the trained male body static and at motion (probably because I would like to have such body too) which made me collecting drawings and bronze figures from 20th mid century sculptors such as Georg Kolbe, Gerhard Marcks. Does your profession affect your aesthetics on art or raise your standards? Well at RZANY & HUND we do a lot of aesthetic interventions so beauty and also ideal bodies might be a part of it. By collecting broken things – like wooden sculptures of saints – well that might be the medical doctor in me that wants to heal. On the wall rail a colored drawing form Walter Ophey, below a Dutch still life with Saint Jerome from the 16th century. On the side a 19th painting of a young girl reading a love letter by Sluyterman von Langeweyde. Courtesy of Prof. Dr. Berthold Rzany. Photo by Pascale Jean-Louis. Do you have any most treasured pieces or favorite artists? Are you more interested in emerging or renowned artists? Foreign or local art? The camel from the backside by Wilhem Kuhnert is still one of my favorite pieces. Besides the 19th and 20th mid century art I do collect some contemporary artists such as Santiago Ydanez who shares my passion for broken and weird looking saints. 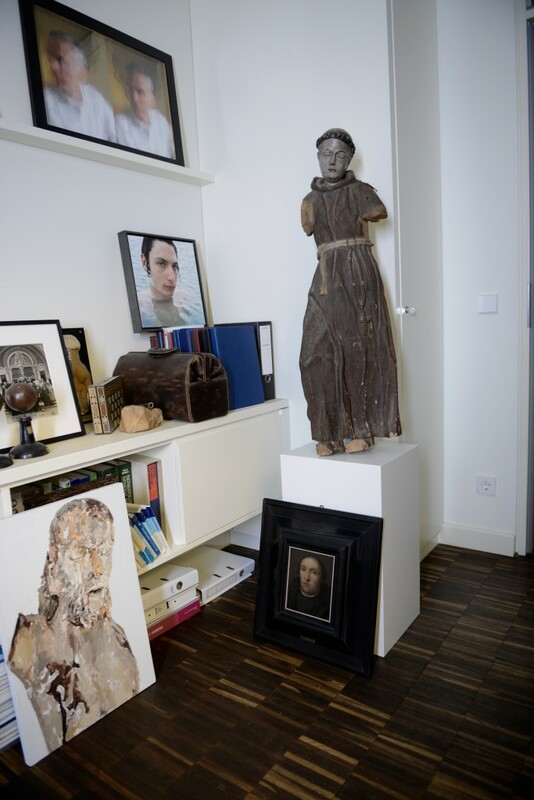 He did paint for me the face of a 16th century life size wooden figure of Jesus Christ which is at my private home and ones belonged to the collection of Walter Wormacka, an East German painter. Frontal view from Prof. Dr. Rzany’s desk. Standing on a pedestal a statue of St. Anthony (Italian/Spanish from the 16th century), below a portrait of a protestant parson from the 16th century. On the wall a double portrait of Prof. Dr. Rzany from his artist friends, Renata Stih and Frieder Schnock, below a portrait photo of Benyamin Reich. Courtesy of Prof. Dr. Berthold Rzany. Photo by Pascale Jean-Louis. Detail of Prof. Dr. Rzany’s cabinet. Standing at the floor a Santiago Ydanez (2015) painted based on a 16th century wooden sculpture of Christ which belonged to the collection of Walter Womacka. Courtesy of Prof. Dr. Berthold Rzany. Photo by Pascale Jean-Louis. How many artworks do you own? Well I do not have a large collection – approximately 150 pieces. How does you collecting style change over time? How do you see your collection developing in the future? Well it does change. At some time I collected Japanese wood prints from the 19th century – mostly the faces of the Kabuki actors – but I lost interest and might at some time point sell the prints. I am pretty sure that the saints and my obsession with saints will stay with me (thanks to my catholic background). I do sometimes see myself in a nursery home looking straight to the 16th century figure of Jesus Christ and to my left to an altar panel from St. Laurent (which is at the moment at my home, too). Any regrets or mistakes made during your collecting career? Not really. All the pieces I bought fascinated me for some time of my life and even when they are not my favorite pieces anymore they accompanied me for some time. Do you have any rules that guide your collecting process? What’s your collecting advice/ beginner tips to people who would like to start collecting? I do collect by heart. That means I have to fall in love with a piece of art. Sometimes the love is short-lived and sometimes it goes on forever. My advice when you start collecting – well if you go to auctions remember your limit! Specifically in a life auction sitting in the auction hall there is always the danger to get too enthusiastic and pay more than the piece might be worth. If you do phone bidding – at least for me – it is easier to stop. 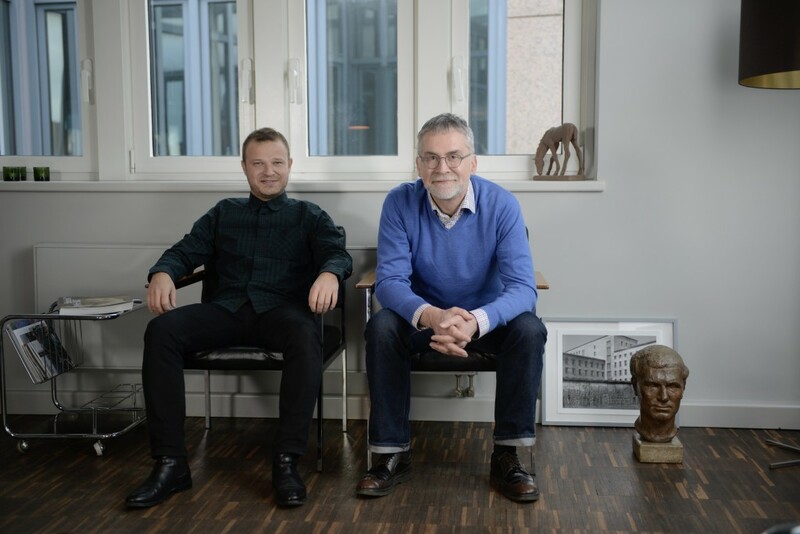 Prof. Dr. Rzany and his architect friend/curator, Hani el Hurt, in unnamed 60s chairs, with Yaysutake Kojma photography from the urban Berlin series (2015), plaster portrait of Walter Jüngst (one of the Prof. Dr. Rzany’s favorites), on the window a small foal from Else Bach. Courtesy of Prof. Dr. Berthold Rzany. Photo by Pascale Jean-Louis. Do you rely on art advisors or how do you make your decisions concerning purchases?Well I mostly rely on myself but for putting the art into context I have my good friend Hani el Hurt, a German-Lebanese architect with an amazing sense for proportions and the potential to build links between different works of art. I love the ease with which he puts a 16th century painting into dialogue with a 19th and 21st century drawing or photograph. I am very happy to have him as an advisor and curator and I cherish the discussions we have while working together. Do you have any close ties with any artists? If so, who? With the 20th mid century sculptors my closest tie would be to visit their museums (e.g. a fantastic small Kolbe museum in Berlin). With living artist it is easier. I have close ties with Santiago Ydanez, a painter of saints, weird animals and human flesh, and to a couple of photographers: Benyamin Reich, a photographer who comes from an Orthodox Jewish family and does superb portraits, Andrei Loginov, from whom I bought the photo of a White Russian homeless as a saint, Yasutaka Kojima who does urban landscapes (so far no saints) and is a stipend at Künstlerhaus Bethanien at the moment and Carina Linge who cites from the old art and interprets it new (I love her still life). Reception room of the clinic. In the back a 19th English desk. Above the desk a Biedermeier still life from the 19th century by Rudolf von Bohr. Courtesy of Prof. Dr. Berthold Rzany. Photo by Pascale Jean-Louis. Where do you keep your collection? At home or at your warehouse? Unfortunately most is hiding in paper filling cabinets, some is displaced at home and some which is most important for me at our clinic RZANY & HUND. 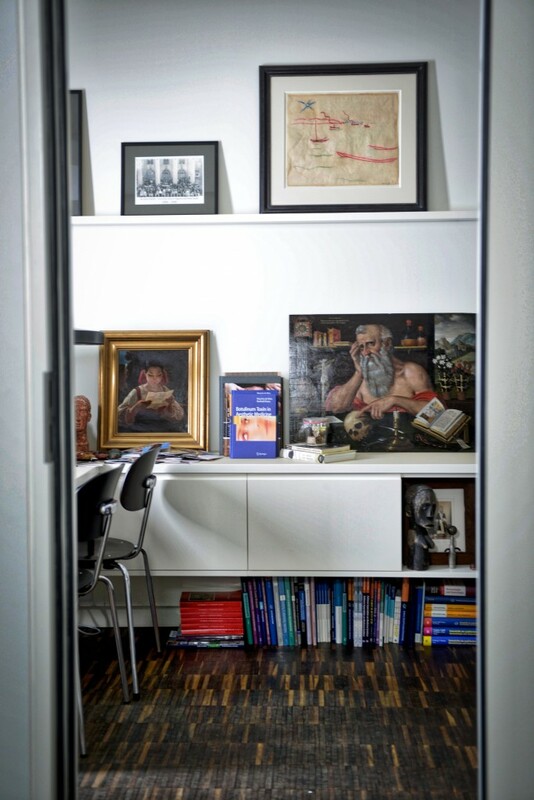 My consulting room is a small art cabinet for the pleasure of my patients and of course myself. What is your display style like? If it would not be with the help of my friend Hani El Hurt it would be more chaotic. However, I still have art everywhere, e.g. standing at floor level, at shelves and of course on the wall. Do you usually think about the space you have before buying a piece or are you more of an impulsive buyer? I am more of an impulse buyer when it comes to pieces say of 1 square-meter and less. If the pieces are larger, I have to admit I am more cautious before falling in love with them and may be because I have gray hair now when I am not sure about a purchase (even a smaller one) I communicate with Hani by “whatsapp” or other apps to have an immediate feedback from him. 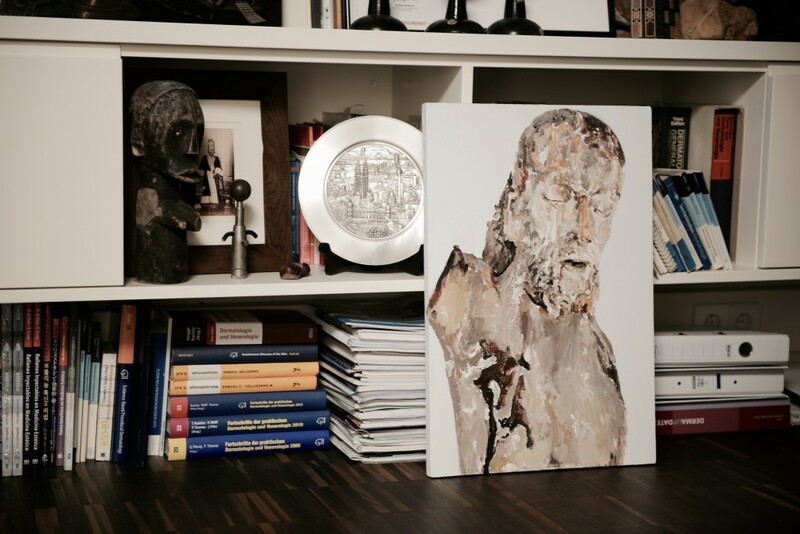 Have you ever publicly displayed some of the artworks in your collection? If not, are you planning to do so in near future? Well as said I do display some of my art at RZANY & HUND our clinic. I guess if a museum plans to have an exhibition on broken saints – I would be in. On the left side an abstract painting by Christopher Andersen(2011) from the Staatliche Akademie der Bildenden Künste Karlsruhe. Courtesy of Prof. Dr. Berthold Rzany. Photo by Pascale Jean-Louis. 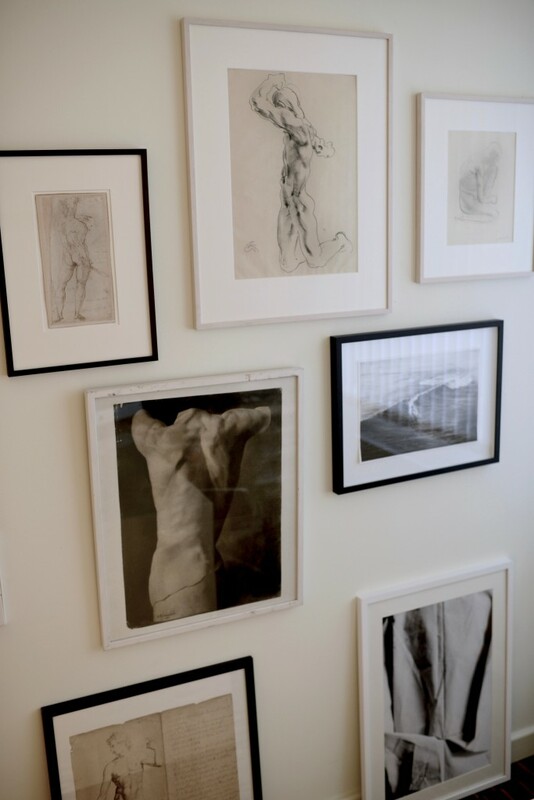 On the athletic wall, with pencil drawings by Georg Kolbe, Gerhard Marcks, Damian Cado (2013, ‘The Surfer’) and unknown artists from the 17-19th century. Standing below a photography by Jana Evers(2013) depicting nettle cloth. Courtesy of Prof. Dr. Berthold Rzany. Photo by Pascale Jean-Louis. What region of art are you looking into and not in your collection yet? Well I am fascinated by African art – but I have not really touched on this so far. What sources do you read to keep yourself informed and updated about the art market? 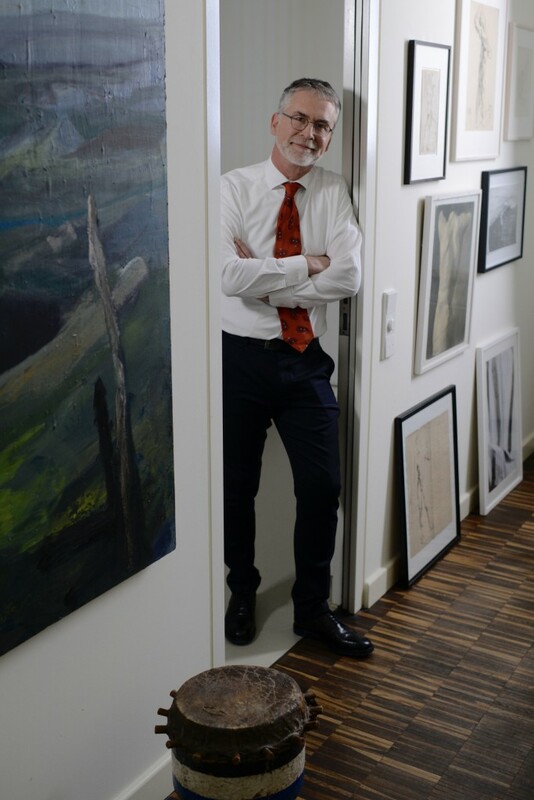 Well I do collect a lot through auction so I follow the larger and smaller German auction houses like Villa Grisebach, Bassenge and Leo Spik, a more local auction house with sometimes hidden treasures. What trends have you noticed in today’s art market from your side of the pond? Thanks god there is not a lot of interest in broken saints. Specifically not in a city like Berlin who has a more protestant / agnostic environment.